Charles was born at Timaru on 20 November 1881, 4th son of Mark and Phoebe (nee Taylor) Saunders, and received his primary education at the Pleasant Point School. His father Mark born in England, was a prolific letter writer to the Timaru Herald, inventor, and very much occupied with attempting to harness the oceans waves for industrial and other labour saving devices. Charles' mother Phoebe was born in Tasmania, and married Mark in 1869. Both of Charles parents are buried in the Pleasant Point cemetery (Mark died 6 March 1928 and Phoebe died 9 January 1927. Charles had served in the military (service no. 9444) prior to World War One, having enlisted at Addington, Christchurch on 14 April 1902, for service with the 2nd Regiment, 10th NZ Mounted in South Africa, along with his brother Eustace (service no. 9449). For this service they were both awarded the South African War Medal with the S.A. 1902 clasp . 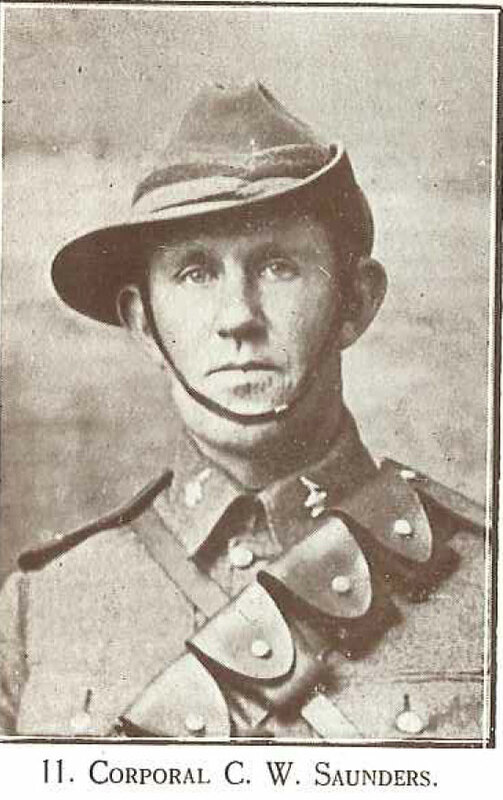 Charles was employed as an engine driver for T. Grigg at Claremont prior to enlisting at Timaru on 20 October 1914, and his brother Eustace, a tailor at Fairlie, was named as his next of kin. He was described as being single, residing in Pleasant Point, Anglican, aged 31, 5 foot 11 ½ inches tall, weighing 168 lbs, chest measuring 34 – 37 inches, having a fair complexion, gray eyes, dark brown hair and good teeth. Charles departed for service in World War One from Wellington on 14 December 1914, with the 2nd Reinforcements, Canterbury Mounted Rifles, aboard SS Verdale, Willochra or Knight of the Garter and arrived in Alexandria, Egypt, on 2 February 1915. After training in Egypt he was sent to the Dardanelles. On 28 July 1915, at Walker’s Ridge, he was promoted to Lance Corporal (unpaid), followed by further promotion to Corporal at Bauchop Hill on 9 August. Taken dangerously ill with para typhoid, he was evacuated to Alexandria and admitted to Bombay Hospital on 1 September, where he died the next day. He was buried in the Alexandria (Chatby) Military and War Memorial Cemetery Egypt. 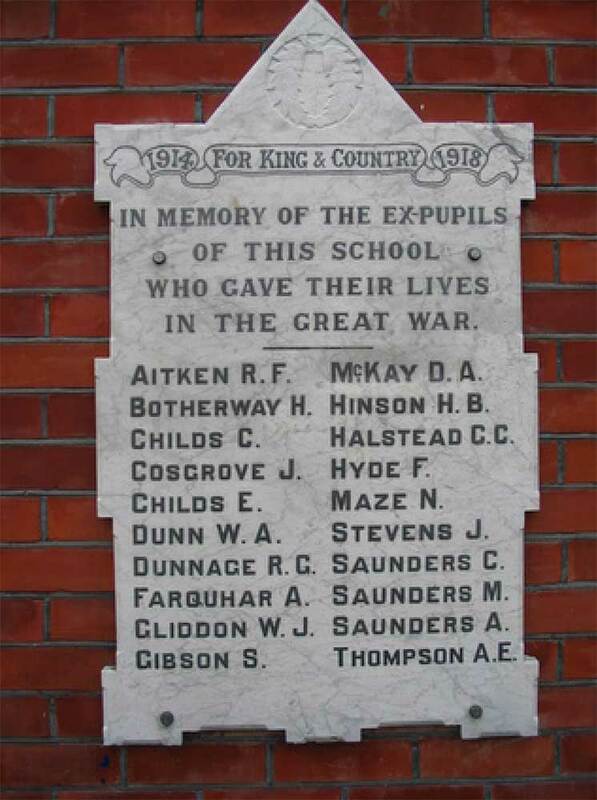 His name is inscribed on the Pleasant Point War Memorial and Pleasant Point School. In October 1921, his mother Phoebe was sent his war medals, the 1914-1915 Star, British War Medal and Victory Medal, and his father Mark received his plaque and scroll later that same year. Charles' brother, Private Mark Saunders (service no. 25323), was killed in action in Belgium on 4 October 1917. His other brother, Eustace, also enlisted on 17 May 1918, but did not serve overseas, being discharged on 29 November 1918.